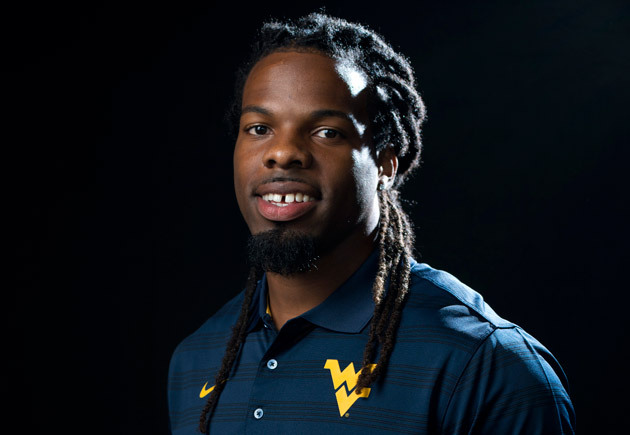 West Virginia's Kevin White wasn't playing football at any level three years ago, a product entirely of his own doing. Now the Mountaineers star is one of the top wide receivers in the country and a highly touted draft prospect. MORGANTOWN, W.Va. -- The first thing you notice is his size, of course. He looks the part, everyone says, and that’s true. 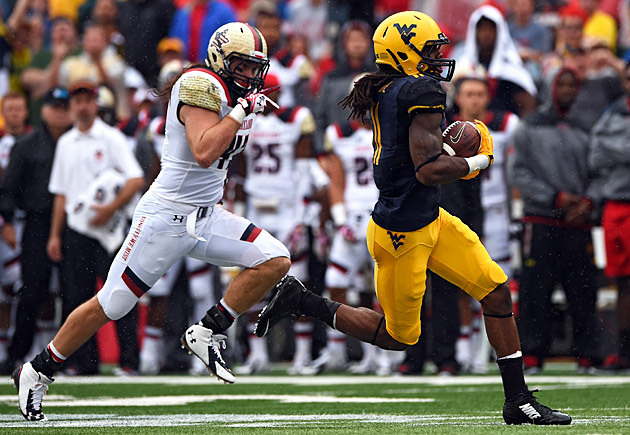 Kevin White Jr. is the type of player you would create in a video game, with hands that could palm small boulders and a stride that effortlessly carries his 6-foot-3, 210-pound frame. He is everything a receiver should be, those close to him emphasize, as if that weren’t obvious from a passing glance. During West Virginia’s 41-27 upset of previously undefeated Baylor on Oct. 18, he made one of the catches of the year. White raced by Bears cornerback Xavien Howard, headed for the back corner of the end zone and corralled Mountaineers quarterback Clint Trickett’s throw with one hand, drawing a flag for defensive pass interference in the process. It was one of many spectacular plays this fall: his leaping 19-yard touchdown against Alabama, his tunnel screen turned 44-yard score at Maryland, his over-the-shoulder 63-yard touchdown grab against Kansas. On Halloween morning White sits in a meeting room at the Milan Puskar Center, West Virginia’s two-story complex connected to the football stadium. He wears a silver tracksuit adorned with the school logo, and his carefully maintained black dreadlocks scatter across the back of his chair. His legs won’t quite squeeze behind the row of seats in front of him, so they spill haphazardly into the aisle, wiggling as he explains how he got here. White is one of the breakout stars of the 2014 college football season. He has made 91 catches for 1,208 yards with eight touchdowns, and on Tuesday was named one of 10 semifinalists for the Biletnikoff Award, presented annually to the best wide receiver in the nation. But he wasn’t playing football at any level three years ago, and that was entirely a product of his own doing. At a young age White had the ingredients to be great. Yet it’s only now, at 22, that he’s figuring out how to put them all together. His transformation began with overdue paperwork. In the spring of 2011 White was finishing his redshirt freshman year at Lackawanna College, a school with an enrollment of 1,500 in Scranton, Pa. He had arrived there in ’10 because his grades coming out of Emmaus (Pa.) High weren’t good enough to qualify for a Division I scholarship. The time had come to select his courses for the upcoming semester. Only he didn’t do it. Then he failed to fill out his financial aid forms. Suddenly the player who talent evaluators now peg as a can’t-miss prospect couldn’t even suit up for the junior college Lackawanna Falcons. He began to train at FASST Performance, a facility run by Jason Brader, where he caught balls fired out of JUGS machines and completed speed, strength and agility exercises. Brader, a Lackawanna alumnus, referred White to his own former coaches, Mark Duda and Charlie Grande, who made room for him on the team. But White injured his shoulder, redshirted and missed the deadline to register for financial aid. Despite his immense potential, his football future was in jeopardy. • BURKE: 2015 NFL Mock Draft 1.0: Where does Kevin White go? This is the point when it all could have ended. Devon Blake, White’s best friend and former juco teammate, remembers White mentioning he wanted to become a social worker if football didn’t pan out, or possibly buy apartment buildings in the area and rent them out to students. That’s just how life goes sometimes; one dream collapses and another takes root in its place. In this case, however, White resumed training at FASST. He trekked with Blake and White's two younger brothers, Ka'Raun and Kyzir, to the Lehigh County Soccer Fields, where they would hurl footballs at each other until it got too dark to see. One day Blake recalls it was dusk and snowing and his fingers started to feel like freeze pops. Everyone was ready to go, but Kevin made the boys stick around for another hour, reeling in passes until he was satisfied. White came back to Lackawanna in 2012 and caught 36 passes for 535 yards with six touchdowns. He focused more intently on his studies, and Grande says he didn’t miss a class or study hall upon his return. Perhaps unsurprisingly, the player who always looked like a superstar attracted some big-time college attention. First Hawaii called. Then Bowling Green. The breakthrough came when Texas Tech extended an offered in late November, proof that White’s once-stagnant career was trending in the right direction. Despite receiving his first power-conference scholarship offer from Texas Tech, White elected to attend West Virginia. His rationale was twofold: Morgantown was closer to home, and he saw how departed standouts Stedman Bailey and Tavon Austin had thrived in coach Dana Holgorsen’s version of the Air Raid offense. White’s first game with the Mountaineers started off promising. A 10-yard first-down reception on his second series. 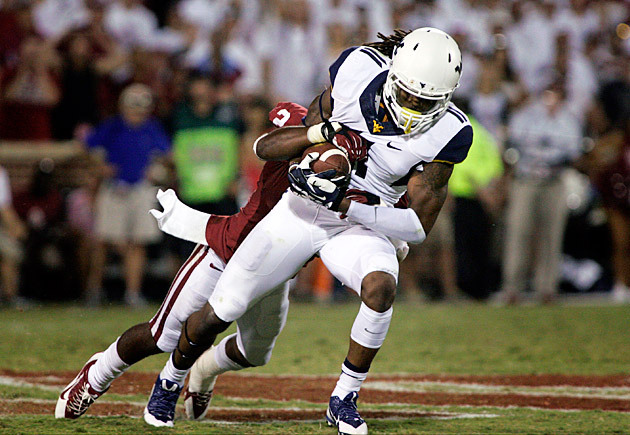 Then catches of nine and seven yards as the Mountaineers attempted to beat Oklahoma on Sept. 7, 2013. With West Virginia trailing 13-7 and a little under five minutes remaining in the third quarter, White ran a crossing pattern on third-and-20. Quarterback Paul Millard passed to White, who burst upfield: to the 30, to the 20, to the 15. He fumbled. Sooners safety Gabe Lynn recovered. West Virginia lost 16-7, and for the next three weeks White didn’t stop beating himself up over it. During the offseason White grew more comfortable. The playbook felt more natural, and he sharpened his ability to read defenses. His conditioning improved and confidence soared; when the Mountaineers ran Law School Hill, an infamously steep slope that players are required to sprint up as part of summer workouts, he would regularly finish near the front of the pack. Things really started to click when White and Trickett drove to campus together for fall camp. Trickett was coming back from the Jersey Shore, and he picked up White while traveling through Pennsylvania. The two talked about everything: their circuitous paths to West Virginia, their future goals and their affinity for a certain female vocalist. “Let’s just say you wouldn’t guess that the guy out there talking crap with the dreads loves Taylor Swift,” Trickett says. In the season opener against Alabama on Aug. 30, their chemistry showed. Trickett and White hooked up nine times for 143 yards with a touchdown. Six weeks later White led the FBS in receiving. (He is now third, averaging 120.7 yards per game.) As this Thursday’s showdown with Kansas State approaches, the kid who always looked the part has begun to play it, too. “I think he goes anywhere between the first and second [rounds],” says an NFL scout, referring to White’s 2015 draft projection. Four days before West Virginia’s 31-30 loss to TCU on Nov. 1, the Mountaineers turned in a mediocre practice. It was the type that’s inevitable over the course of a season, when players are slow coming out of breaks or miss blocking assignments they would typically recognize. On this Tuesday, White and Trickett were especially out of sync, miscommunicating on some routes and failing to connect on others. That’s sometimes hard for White to believe. Three years is hardly enough time to reinvent oneself, let alone come to terms with it. Over that span he has morphed from a juco castoff into a Division I All-America. He has even been compared to Arizona Cardinals star Larry Fitzgerald, a parallel noted by Fitzgerald himself. Now, unmistakably, everybody does. White has gotten this far. As he continues to put the pieces together, the question is how much farther he will go.